Maximum efficiency in the luxury class, supreme dynamics in the hybrid segment – precisely these are the unique standards offered and combined with one another by the BMW Concept 7 Series ActiveHybrid. Introducing this Concept Car based on the new BMW 7 Series, BMW is clearly demonstrating the potential offered by the most advanced hybrid technology available today. 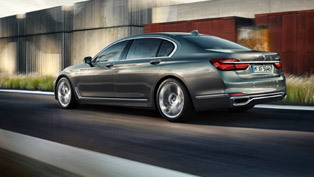 The BMW Concept 7 Series ActiveHybrid comes with hybrid components tailored precisely to the character of this unique saloon, offering driving comfort, everyday motoring qualities and driving safety of the supreme standard only the BMW 7 Series is able to provide. 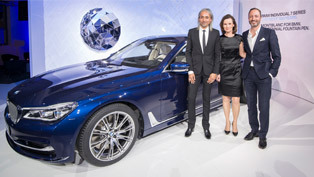 In addition, the BMW ActiveHybrid technology featured in the Concept Car reduces both fuel consumption and emissions by 15 per cent versus the same car with a combustion engine and offers a standard of driving dynamics clearly exceeding all series models with hybrid technology presented so far. The BMW Concept 7 Series ActiveHybrid combines an eight-cylinder gasoline engine and an electric motor developing 15 kW/20 hp and maximum torque of 210 Newton-metres/155 lb-ft as a mild hybrid concept. Electric power is generated by a particularly powerful variant of Brake Energy Regeneration already featured in the BMW Group's regular production cars. 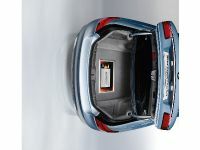 The energy generated in this way is then stored in a lithium-ion battery fitted in accordance with the package of the car beneath the luggage compartment. This electrical energy serves to supply the on-board network and, in addition, to boost the combustion engine under clearly defined driving conditions. The result is a significant optimisation of engine power and response ensuring even more dynamic acceleration whenever required. BMW ActiveHybrid technology thus supports the BMW EfficientDynamics development strategy in a particularly intelligent manner, offering even greater driving pleasure on less fuel as well as cleaner emissions. 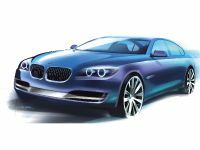 BMW ActiveHybrid is an important building brick within the BMW EfficientDynamics development strategy as a whole. 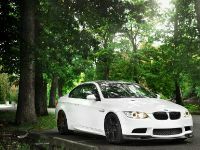 Pursuing this strategy, the BMW Group has indeed introduced a wide range of Even More Superior, Dynamic and Efficient ? 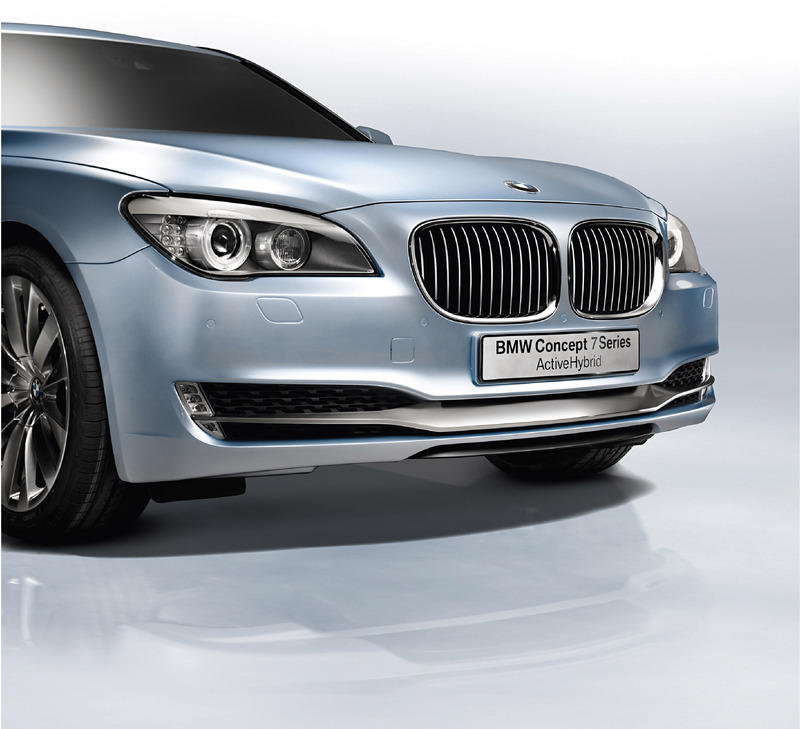 Hybrid Technology BMW Style: The BMW Concept 7 Series ActiveHybrid. efficiency-boosting features in series production throughout the entire model portfolio, thus achieving unique progress the world over in the reduction of fuel consumption and emissions. Sales of BMW cars with EfficientDynamics since the year 2007 already exceed a million units. Accordingly, this broad-scale strategy lauded on many occasions through significant prizes and awards has led to a substantial reduction of average fuel consumption by the BMW car fleet. Parallel to this trendsetting strategy, the BMW Group is developing hybrid technology along various lines for various vehicle segments. The objective of this elaborate development process is to create hybrid systems significantly reducing fuel consumption while maintaining the driving dynamics so typical of the brand, in this way living up to the great demands made of a BMW in every respect. Pursuing this strategy, two models with BMW ActiveHybrid technology will be reaching production level in 2009 alone. The perfect starting point: the world's most efficient luxury performance saloon. The BMW Concept 7 Series ActiveHybrid is based on the new BMW 7 Series already ranking right at the top in its class in standard trim in terms of efficiency. 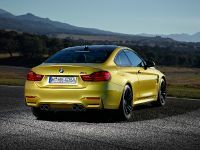 The new luxury performance saloon from the world's most successful manufacturer of premium cars thus lives out the demanding objectives of the BMW EfficientDynamics development strategy in particularly convincing style also in this segment. Compared with their predecessors, all models in the new BMW 7 Series stand out in providing both enhanced performance as well as a significant reduction of fuel consumption and exhaust emissions. In their respective performance class, the three engines available right from the start upon the market launch of the new 7 Series rank right at the top worldwide in terms of efficiency. In addition, all models in the BMW 7 Series come as standard with a wide range of BMW EfficientDynamics technologies including Brake Energy Regeneration, on-demand control of the engine's ancillary units, intelligent lightweight construction, active aerodynamics provided by air flap control, and tyres with reduced roll resistance. 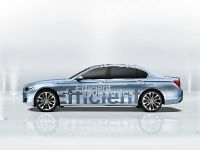 And last but certainly not least, all engine variants in the new BMW 7 Series comply in full with the EU 5 emission standard. Given these qualities, the new BMW 7 Series from the start offers an ideal foundation for setting the standard worldwide both in the luxury segment and in the hybrid market through an optimum combination of the most advanced BMW ActiveHybrid technology. 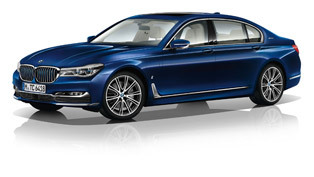 Another essential feature of the BMW Concept 7 Series ActiveHybrid is that this unique model offers such a significant increase in efficiency over the regular production model without in any way giving up the well-known qualities of BMW's luxury saloon. Not to be seen from outside, BMW ActiveHybrid technology offers the driver the significant benefits of a new drive concept without in any way influencing the motoring comfort, luxurious ambience, and safety this truly outstanding saloon is able to provide. And when it comes to everyday driving qualities, the concept is once again just right for full enjoyment and driving pleasure in every respect, without the slightest restrictions. 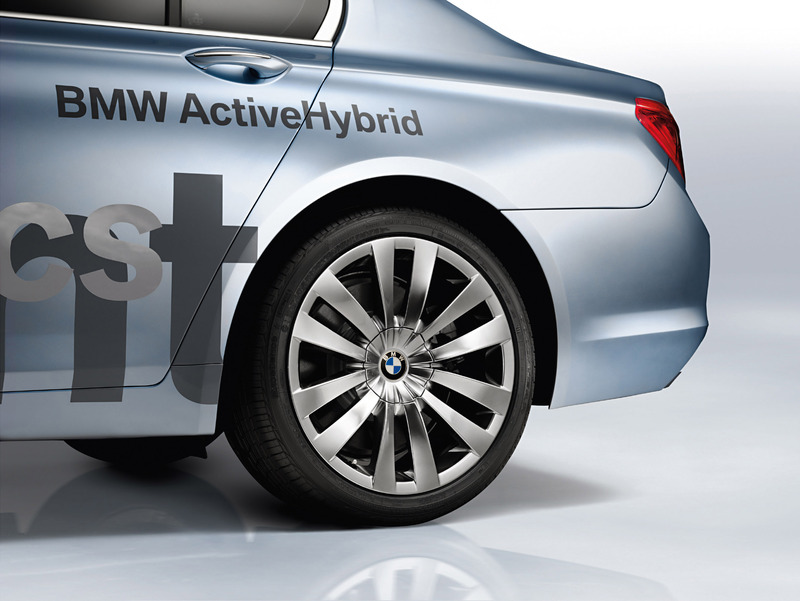 BMW ActiveHybrid technology integrated the intelligent way. 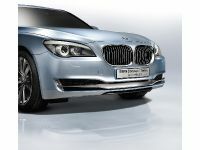 Presenting the BMW Concept 7 Series ActiveHybrid, BMW is introducing a hybrid car which, through its harmoniously balanced drive components, will fit perfectly into the model range of BMW's new luxury performance saloons. The driving experience and motoring comfort reflect the character of this outstanding model line, with new highlights in terms of both driving dynamics and efficiency – as on BMW's conventional model variants, too. Quite simply, this is because hybrid technology BMW-style stands for superior dynamics combined with outstanding efficiency forming a perfect symbiosis with the sheer supremacy of the BMW 7 Series. All this is made possible by combining an eight-cylinder petrol engine for the first time with a mild hybrid concept. Specifically this approach has been chosen here since the savings potential offered by hybrid technology increases with the output and performance of the combustion engine used, and because large-capacity power units are of particular significance in the premium segment. Focusing initially on smaller cars, BMW has already introduced solutions in the context of EfficientDynamics serving to significantly reduce fuel consumption and not in any way increasing the cost of ownership for the customer. BMW's current diesel models in this segment, for example, thanks to BMW EfficientDynamics, ensure fuel consumption and emission ratings achieved by other manufacturers with their hybrid cars only on a far lower level of output and performance. In the medium term the development of hybrid systems by the BMW Group tailored to individual models will also lead to solutions in segments offering significant advantages in both fuel economy and driving dynamics so typical of BMW. 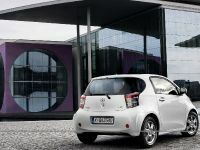 And at the same time the larger number of models produced will help to reduce the additional cost of hybrid technology. Mild hybrid and the combustion engine form an ideal match in the BMW Concept 7 Series ActiveHybrid as is already the case in the Concept X6 ActiveHybrid combining a full hybrid concept with an eightcylinder petrol engine. Taking these different approaches, BMW is already demonstrating the broad-scale application of hybrid technology, proving that in this area, too, model- and concept-specifi c solutions will pave the way towards maximum efficiency in all segments of performance and individual vehicles. Consistent optimisation: BMW ActiveHybrid and the V8 power unit with Twin Turbo and High Precision Injection. Like all power units in BMW production cars, the combustion engine featured in the BMW Concept 7 Series ActiveHybrid has been developed in the context of BMW EfficientDynamics. 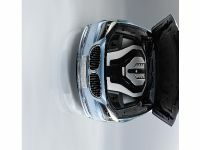 In the BMW 750i this all-aluminium power unit offers all the qualities typical of an eight-cylinder in incomparably sporting and, at the same time, comfortable style, combining power and traction from low engine speeds with impressive pulling force throughout a wide range of engine revs. The power and performance characteristics of the new V8 power unit result primarily from BMW's innovative Twin Turbo technology. This unique technology featured for the first time on an eight-cylinder gasoline engine, with two turbochargers not fitted at the outside, but rather directly in the V-section of the engine and supplying four cylinders with compressed air in each case, ensures unparalleled spontaneity in responding to the accelerator pedal. High Precision Injection, in turn, ensures highly efficient use of fuel, the second generation of direct gasoline injection introduced by BMW incorporating piezo-injectors fitted in the cylinder head directly next to the spark plugs and delivering fuel to the combustion chambers at a pressure of 200 bar. This concept alone makes the supply and dosage of fuel extremely precise, the V8 power unit with Twin Turbo and High Precision Injection achieving the highest level of efficiency worldwide in the eight-cylinder segment. This outstanding efficiency is also attributable to the use of BMW EfficientDynamics in and around the engine, with features such as Brake Energy Regeneration, on-demand management and control of ancillaries including an a/c compressor operating only when required, and the use of on-demand pump technology on the car's suspension control systems. This intelligent energy management also comprises the electrification wherever possible of comfort functions running on electrical energy generated in particular by Brake Energy Regeneration. Use of electric power generated without consuming fuel in the interest of even greater efficiency. Given all these qualities, intelligent alternator control ensures the generation of electricity from energy otherwise wasted in the brake system as heat dissipated into the environment. Now, therefore, the fuel contained in the energy burnt is used to a much higher degree for ensuring genuine driving dynamics on the road, helping to improve the car's acceleration to an even higher level and optimising the efficiency of the drive system under all load conditions. 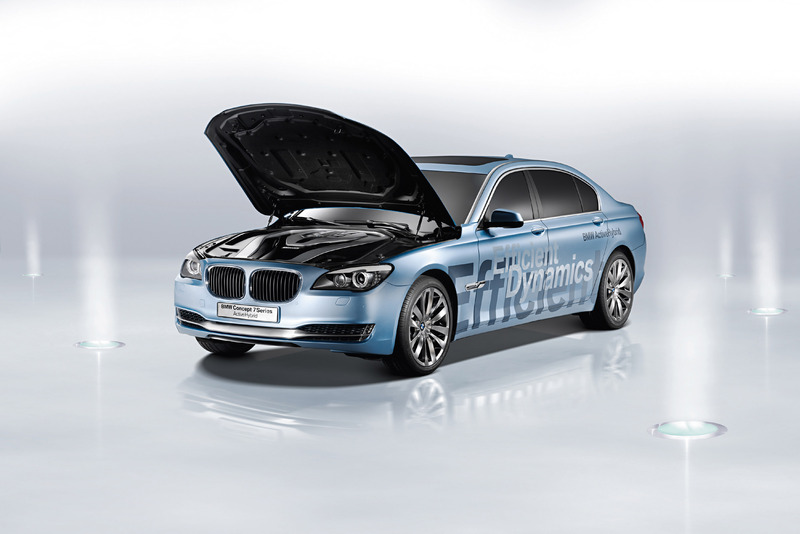 The principle of Brake Energy Regeneration is applied in the BMW Concept 7 Series ActiveHybrid more consistently than in any production vehicle so far, giving the car an unusually high standard of all-round efficiency and fuel economy. In this case the conventional alternator is replaced by the electric motor fully integrated in the transmission housing and delivering electricity in overrun and under application of the brakes through the likewise fully integrated power electronics to the lithium-ion battery. The electric motor integrated in the transmission housing thus ensures far greater efficiency in the generation of electric power than an alternator drawing energy directly from the combustion engine and, as a result, reducing its overall standard of efficiency. BMW ActiveHybrid technology is also superior to a conventional alternator through its own, inherent efficiency, the energy yield produced by the electric motor through Brake Energy Regeneration alone exceeding the normal standard roughly ten times. 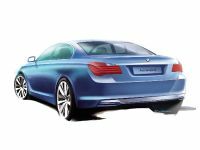 The innovative energy storage technology of the lithium-ion battery featured in the BMW Concept 7 Series ActiveHybrid also provides the option to store a much greater amount of electrical energy available virtually free-of-charge, then providing this energy on a permanent basis for all kinds of vehicle functions and therefore exceeding the performance of conventional battery units by far. The progress achieved by BMW in the area of energy storage thus allows electrical operation of ancillary units to an extent far beyond the standard possible so far in a production car. A further point is that the BMW Concept 7 Series ActiveHybrid uses electrical energy to an even higher degree also for additional functions ranging all the way to extra power provided by the electric motor within the mild hybrid concept in support of the car's primary drive system. This is also made possible by the specific position of the electric motor in the transmission housing, where it is able to offer an additional power feed. A 120V on-board network serves to meet further purposes and requirements, operating in parallel to the conventional 12V network. And with its output of 15 kW, the electric motor supports the combustion engine in generating dynamic power serving to drive the car. Since the energy used in the process is delivered by Brake Energy Regeneration without any additional consumption of fuel, the mild hybrid concept gives the car extra dynamics combined with a significant improvement of efficiency. This additional power and reduction of the load acting on the combustion engine throughout the entire range of engine speed and running conditions enables the Concept Car featuring BMW ActiveHybrid technology to consistently continue the BMW EfficientDynamics development strategy raised in this way to an even higher level. 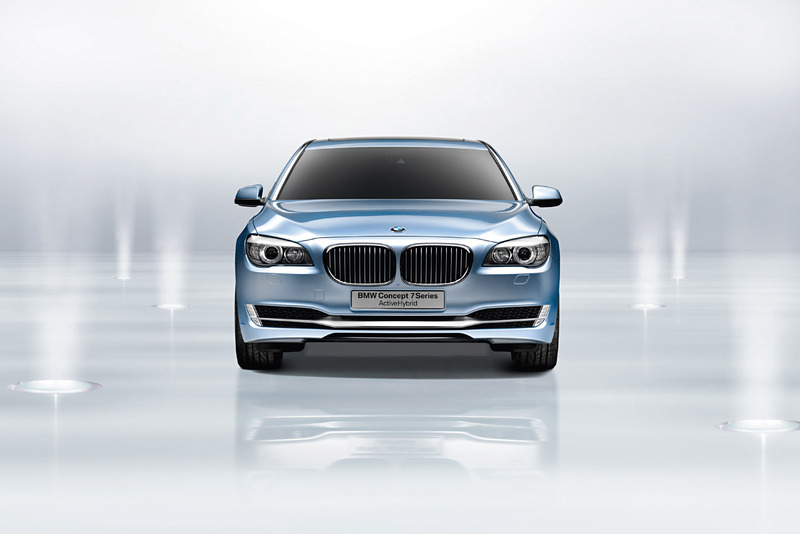 A harmonious concept: BMW ActiveHybrid in the BMW 7 Series. The harmonious overall concept of the BMW Concept 7 Series ActiveHybrid is just as impressive as the progressive technology of the car and its efficiency in reducing both fuel consumption and emissions. All components are carefully matched to one another, coming together to form one fascinating, trendsetting whole. The car itself offers all the qualities of a modern luxury saloon, setting standards through the space available and the exclusive ambience within the interior as well as with its drivetrain and suspension technology allowing an outstanding combination of dynamic performance and supreme motoring comfort. 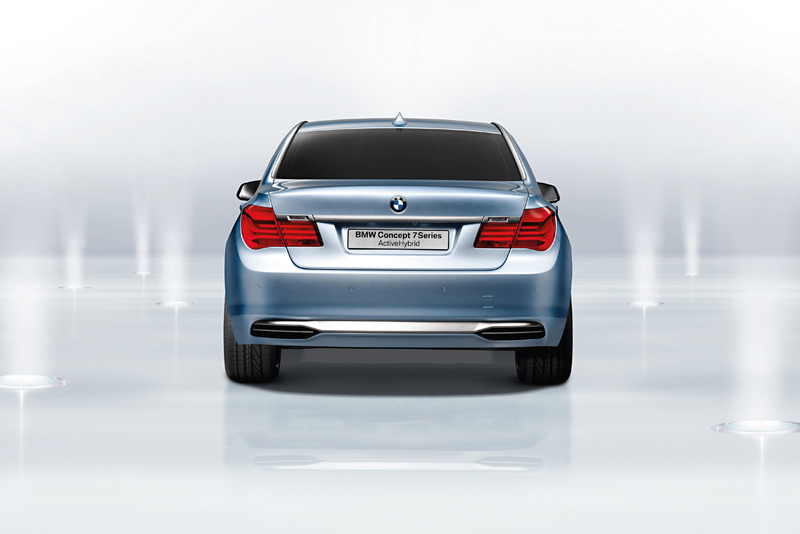 BMW ActiveHybrid technology specially conceived for the saloon serves to enhance the driving experience in genuine style typical of a BMW 7 Series and at the same time achieves a new level of all-round efficiency. Hence, the Concept Car offers improvements and options raising the very favourable balance of performance and fuel consumption already offered on the series-production BMW 750i to a significantly higher standard. The arrangement of the hybrid components likewise serves to enhance the degree of efficiency and promote the driving experience even further. Positioned appropriately within compact dimensions in the transmission housing, the electric motor optimises both the generation of electricity and the drive power delivered by the combustion engine. Housed in the rear of the car, in turn, the lithium-ion batteries offer an ideal solution in terms of both everyday driving qualities, the balance of the overall vehicle, and safety. Ultra-modern energy storage technology: lithium-ion battery with superior capacity and stable cycles. Using a lithium-ion battery, BMW is taking yet another step into the future in the particularly intense and flexible use of electric power in the car. 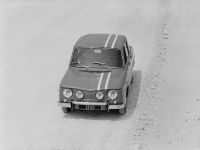 As a rule, the energy delivered by Brake Energy Regeneration must be fed to a storage unit at all times and must be available – depending on driving conditions – in different cycles, whenever required. In addition, storage capacity must be sufficiently great for the car to cover longer distances without application of the brakes or running in overrun, while at the same time the supply of electric power must not be interrupted. This is why BMW uses AGM (Absorbent Glass Mat) batteries on regular production cars featuring Brake Energy Regeneration, that is cars running in frequent and irregular charge and discharge cycles without losing energy in the process. To meet the requirements of a mild hybrid concept, on the other hand, a car needs a high-voltage energy storage unit with significantly higher output and performance. 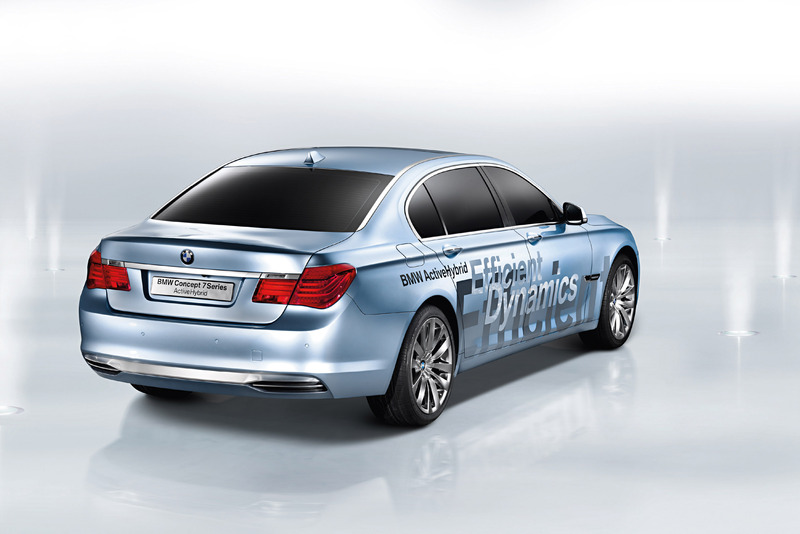 The system developed for the BMW Concept 7 Series ActiveHybrid therefore uses the most advanced lithium-ion technology fulfilling the greatest demands in terms of battery capacity and lasting performance. The lithium-ion battery has proven its particularly high storage capacity and resistance to charge and discharge cycles for a long time in many other areas, for example in the mobile phone and in laptops. 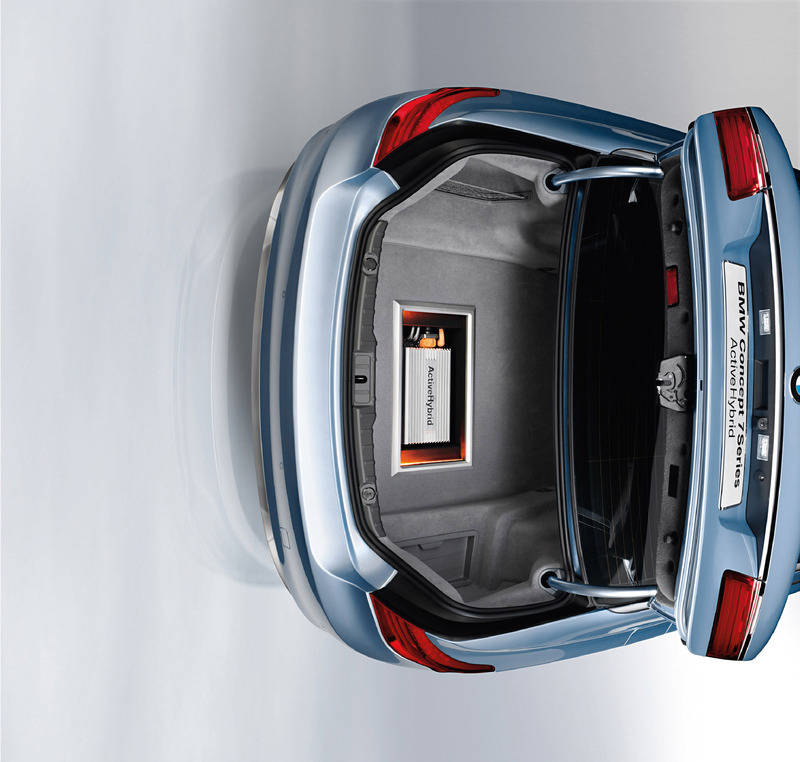 The energy storage unit featured in the BMW Concept 7 Series ActiveHybrid therefore opens up a new perspective in the use of this technology under the particularly demanding conditions prevailing in a motor vehicle. Intelligent energy management with a lithium-ion battery, an AGM battery and two on-board networks. To ensure efficient energy management meeting all of the driver's and passengers' requirements, the BMW Concept 7 Series ActiveHybrid comes with two on-board network systems carefully matched to one another. 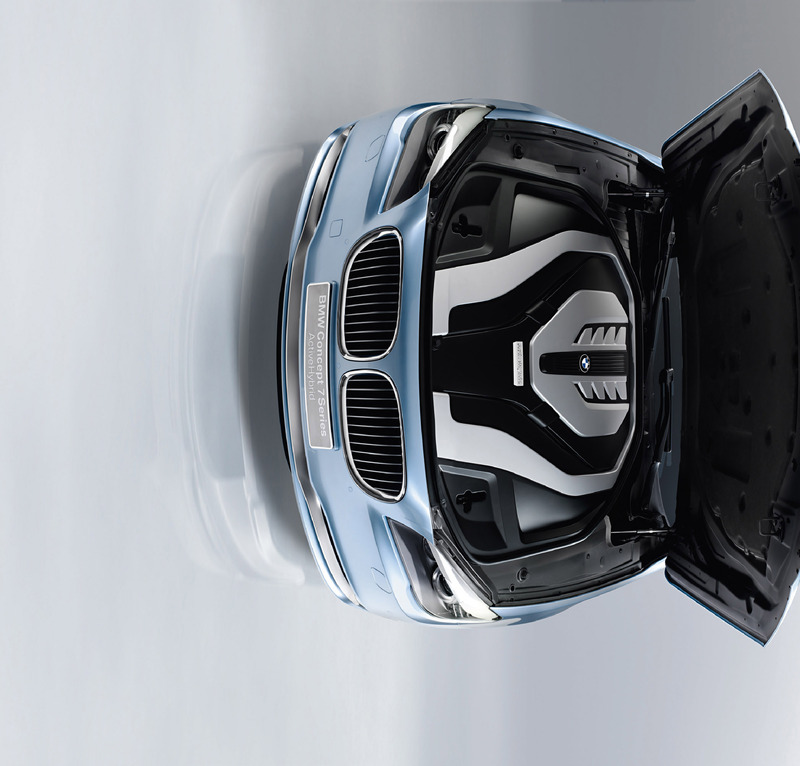 In addition to the conventional 12V network supplied with power by the AGM starter battery, BMW's new Concept Car features an innovative 120V network feeding power from the electric motor to the appropriate components with the help of the lithium-ion battery. Through the 120V on-board network, the lithium-ion battery featured in the BMW Concept 7 Series ActiveHybrid is able to supply power to a particularly large number of electrical components. A further point is that the high-voltage power network provides the foundation for using a high-performance electrical drive system. Contrary to the conventional on-board network, this also means the option to supply power directly to, say, the a/c compressor. The range of functions already driven electrically today in BMW's production models extends from the ventilation and air conditioning units through the lights, entertainment, navigation and communication systems all the way to the coolant pump and servo motors for dynamic driving systems such as Dynamic Damper Control featured as standard on the BMW 7 Series. Stable and reliable coverage of all energy requirements and all electrically driven vehicle functions in the BMW Concept 7 Series ActiveHybrid is therefore guaranteed at all times, regardless of driving conditions. 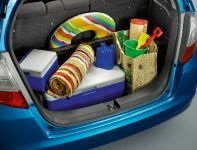 High storage capacity enhancing both efficiency and motoring comfort. Among other things, this allows the use of the Auto Start Stop function in conjunction with BMW ActiveHybrid technology even more often than in BMW's current production models, without giving up or losing motoring comfort in any way whatsoever. When stopping at a road junction, at the traffic lights or in a traffic jam, the combustion engine is automatically switched off to avoid any inefficient idling. Then, as soon as the driver lets go of the brake pedal and presses down the gas pedal to set off again, the engine is started automatically. 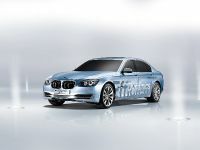 The various functions no longer connected to the alternator on the BMW Concept 7 Series ActiveHybrid may also be operated during such an interim stop, the energy required for this purpose being delivered consistently by the high-capacity lithium-ion battery. Optimum comfort is ensured above all by ongoing operation of the ventilation and climate control systems keeping temperatures in the interior at a consistent level also when the car is at a standstill. Similarly, all other comfort functions may still be used permanently while the engine is switched off. Clear highlights in design bearing testimony to the car's efficiency and trendsetting technology. The BMW Concept 7 Series ActiveHybrid is a hybrid car offering a dynamic potential truly unique the world over – and at the same time it is a luxury performance saloon with an excellent balance of performance and fuel consumption. Precisely these unique qualities come out clearly also through the design of the Concept Car. The BMW Concept 7 Series ActiveHybrid is based in its concept and fundamental design on the new BMW 7 Series, a luxury saloon offering a fascinating synthesis of sporting elegance and natural presence. The dynamic proportions of the car are clearly expressed by its long wheelbase, the long and sleek engine compartment lid, the short overhang at the front, the passenger compartment moved far to the rear, and the low roofline. The BMW Concept 7 Series ActiveHybrid adds specific design features both at the front and the rear to enhance this characteristic look to an even higher level. 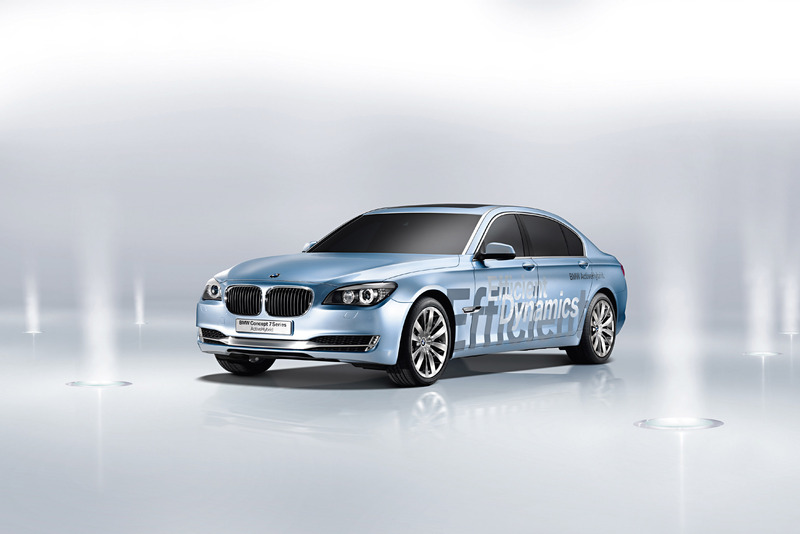 At the same time the close match of the production model and the concept car clearly symbolises BMW's claim to offer the potential of BMW ActiveHybrid technology within BMW's existing portfolio of models. And the paintwork in Blue Water Metallic already used on other high-efficiency concept cars clearly bears testimony to the outstanding efficiency of this very special saloon. Optimised air guidance at the front. 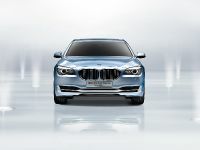 The outstanding presence and flair of the new BMW 7 Series is expressed at the front end of the car particularly by the large BMW kidney grille standing out far to the front in an almost majestic, upright position. Generously designed dual round headlights, in turn, create that concentrated look so typical of BMW, while the large engine compartment lid exudes a feeling of clarity and tranquillity. Contrary to the series model, the BMW Concept 7 Series ActiveHybrid comes with an aluminium band slightly inclined towards the rear and somewhat lower down, instead of the usual chrome band above the lower air intake scoop. 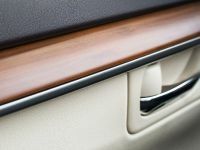 This aluminium trim extends across the entire width of the car, tapering out towards the outside. In this position and with its special design featuring a precise contour and angle, the aluminium band resembles an air flap typically used on a modern aircraft. Featured on the front end of the BMW Concept 7 Series ActiveHybrid, the band serves in a similar manner to optimise aerodynamics and air guidance along the lower section of the car. The centre section of the aluminium band, in turn, covers the lower air intake scoop, while the two slender edges beneath the headlights subdivide the air intakes at the side with contours similar to the headlights themselves. Foglamps are fitted at the outer edge of the two air intakes boasting a black honeycomb grid again in unique design. These foglamps are made up in each case of seven LED light units, six of which are arranged vertically in rows of two and one of which is below the aluminium band. The horizontal line of the aluminium band and the foglamps placed far to the outside serve in this way to additionally accentuate the sheer width of the car. 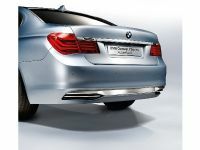 From the side the sporting and elegant lines of the saloon are accentuated by 20-inch aluminium rims on the BMW Concept 7 Series ActiveHybrid. The wheels in V-spoke design are finished in body colour and thus merge even more smoothly and harmoniously with the overall look of the car. 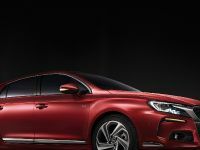 The name "EfficientDynamics – ActiveHybrid" on the lower part of the doors, finally, highlights this outstanding saloon as a particularly fuel-efficient, low-emission concept. Exclusive design on the exhaust tailpipes. 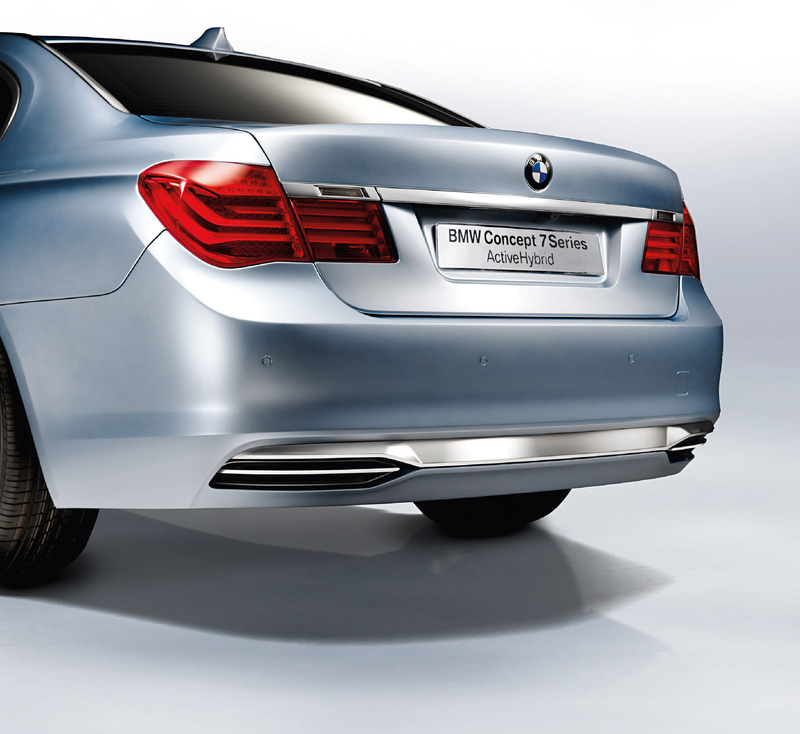 The particular style created at the front of the car by the aluminium band is reflected by the rear-end design of the BMW Concept 7 Series ActiveHybrid where an aluminium air flow element extends across the entire width of the car beneath the rear apron, reaching its full height only in the middle. 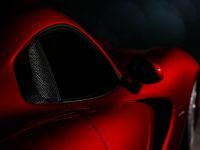 The more slender edges to the right and left form the upper surround on the twin-chamber exhaust system with its tailpipes again coming in new, innovative design. The tailpipes are surrounded by a frame of matt chrome and, instead of their usual round or oval shape, come in unusually wide and flat contours. A horizontal, black crossbar, finally, gives the tailpipes an almost multi-level appearance as if they were split up into two sections. The aluminium band at the rear again forms an additional horizontal line emphasising the wide track of the car. At the same time the sculptural surfaces so characteristic of the new BMW 7 Series also dominate the looks and appearance of the BMW Concept 7 Series ActiveHybrid, again creating that unique BMW style. The roofline, in turn, flows down via the flanks of the car all the way to the bumper, thus including the rear end in the overall dynamic look of the new BMW 7 Series for a particularly sporting touch. Unique: BMW ActiveHybrid technology in the luxury class. Introducing the BMW Concept 7 Series ActiveHybrid, the world's most successful manufacturer of premium cars is setting a clear standard: Hybrid technology has the potential to meet the extremely great demands made of a car in the luxury class. And at the same time it offers all the qualities required to further enhance the characteristics typical of a BMW. This nevertheless calls for hybrid components precisely tailored to the respective model and boasting features exactly reflecting the profile of the BMW brand. To meet this demand, BMW has applied its unique development competence in the area of drive systems unparalleled the world over for the systematic and clear-cut integration of hybrid components. The result of this intense development process is BMW ActiveHybrid – a technology able to provide the most dynamic hybrid cars in the world and serving at the same time to offer the greater efficiency achieved by combining a combustion engine with electric drive under all motoring conditions, significantly reducing both fuel consumption and emissions in the process. The BMW Concept 7 Series ActiveHybrid is therefore more superior, more dynamic and more efficient than all other cars featuring this kind of technology so far. Yet another important highlight of BMW ActiveHybrid technology is the ability to offer the full potential of this technology quite independently of the driver's action. This big advantage comes from the fact that BMW ActiveHybrid technology is fully integrated into the drive system, without any effects on the design of the car and its everyday use. Hybrid technology therefore fits perfectly into the BMW EfficientDynamics development strategy, where all EfficientDynamics components and features come as standard on BMW's various models, tailored in each case to the specific model and its individual character. These components and technologies therefore help to reduce fuel and exhaust emissions over a wide range of loads also under practical, everyday driving conditions, to a great extent without requiring any action on the part of the driver. And BMW ActiveHybrid technology also remains in the background to begin with, at the same time naturally offering its full effect in terms of efficiency and dynamics. Best of Hybrid: flexible development strategy providing ideal solutions on each model. Given these qualities, the technology featured in the BMW Concept 7 Series ActiveHybrid is ideally suited for a luxury performance car of this calibre. Taking the same approach as with many other highly developed and advanced technologies, BMW seeks also in the implementation of hybrid components to introduce these technologies initially in higher segments of the market such as the luxury performance class. Clearly, this gives particular emphasis to the premium claim underlying each new development. 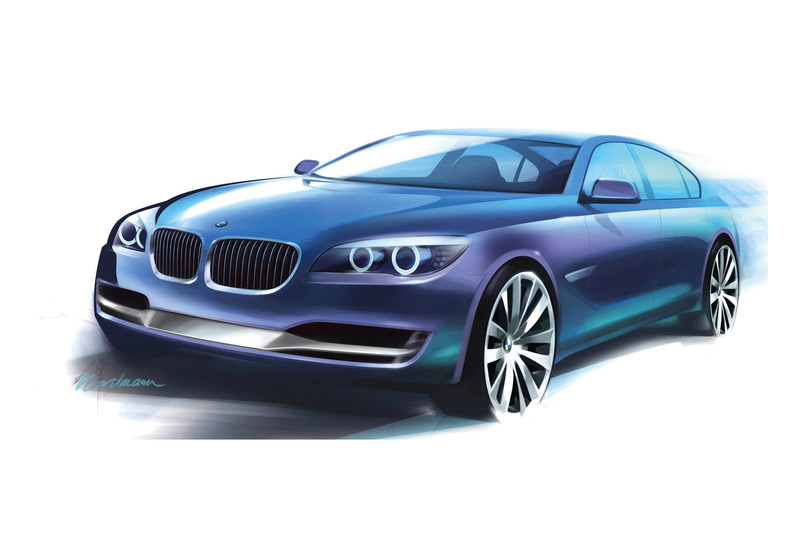 In developing hybrid components BMW seeks furthermore to find appropriate applications for each model and concept. BMW ActiveHybrid is based on a modular principle following the "Best of Hybrid" strategy in integrating the optimum components in different vehicle concepts as required. On the BMW Concept 7 Series ActiveHybrid the eight-cylinder petrol engine and the electric motor acting as the mild hybrid power unit form the same ideal match as the eight-cylinder petrol engine and the full hybrid concept on the BMW Concept X6 ActiveHybrid launched in 2007. Indeed, this broad scope of possible hybrid applications reflects the underlying principle of BMW EfficientDynamics to develop appropriate solutions for all vehicle segments and performance classes in line with each concept and vehicle. BMW is developing these hybrid components in a joint venture among equals with Daimler. The objective of this joint venture is to develop and test components for hybrid drive in upmarket vehicles, each manufacturer then integrating the hybrid components developed into their respective cars in accordance with the individual philosophy of each brand. 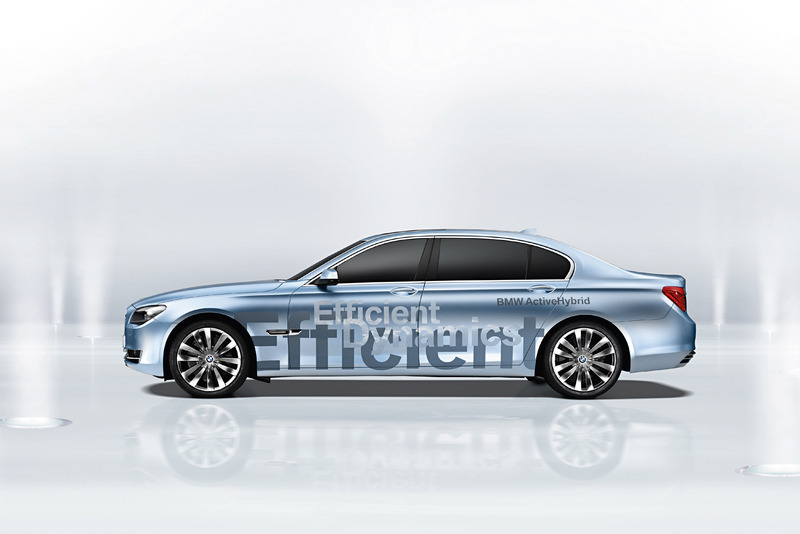 Ongoing progress ensured by BMW ActiveHybrid and BMW EfficientDynamics. Pursuing the BMW EfficientDynamics development strategy, the BMW Group is making the most effective contribution worldwide to the reduction of fuel consumption and emissions in road traffic. The result of this unique strategy results from both the regular use of such trendsetting innovations as standard equipment on BMW models and from the introduction of such innovations throughout all model series, as well as the wide range of improvements ensured in this way. BMW ActiveHybrid now takes a significant step into the future in this context of highly developed technologies for the environment, opening up the door to an even wider range of technologies for reducing fuel consumption and emissions in the years to come and using an appropriate combination of features in each case and for each model in the interest of enhanced driving dynamics and all-round economy. The objective is to develop concepts for all model series providing utmost driving pleasure on the most efficient use of energy. 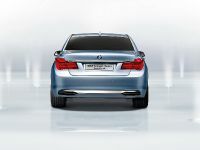 Now BMW offers a unique range of efficiency-enhancing technologies also in the luxury saloon segment, with BMW's regular models in the new BMW 7 Series already featuring a wide range of improvements through BMW EfficientDynamics quite unparalleled the world over in their impact and diversity. BMW ActiveHybrid technology adds a further option, hybrid technology for the first time achieving the supreme standard essential to BMW in a luxury performance car of this calibre. So introducing the BMW Concept 7 Series ActiveHybrid, BMW is proudly presenting another strategy in further enhancing the Company's position as the world leader in the development of particularly efficient and, at the same time, highly dynamic automobiles of a unique standard.